It has been quite a while since we heard anything on the Creative's inPerson. And now it seems that besides medium size businesses, Creative is also targeting educational institution. 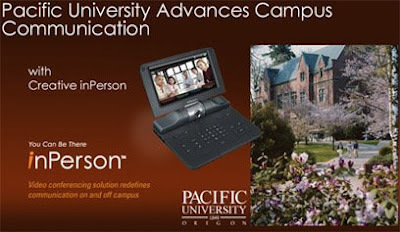 Pacific University in Forest Grove, Oregon has apparently ordered 16 sets of inPerson to "provide video conferencing capabilities to and from every building on campus in a cost-effective manner.". "Immediately after implementing inPerson the university noticed an increase in meeting effectiveness, a direct result of participants being able to interact face-to-face. inPerson continues to reduce travel for the University's executive team, saving valuable time and money, resulting in higher productivity." It is comforting to hear that the Creative inPerson is actually going somewhere. Maybe one day, we will see it in schools, hospitals, homes and even airports?